We’ve all been there, or at least watched uncomfortably as we saw one unfold in a movie, that awkward first date. The eternity after the doorbell is answered before one of you figures out what to do or say—or worse the rush of inane comments that bump into one another like strangers on a subway. So many questions swimming in our heads: Was my last comment as utterly stupid to his/her ears as it was to mine? I’m (or She’s) a modern woman, so who’s going to pick up the tab? Is there spinach in my teeth? Of course, prior to those dilemmas you must first find someone to ask out. Sometimes I wish there was an Internet “dating site” to find critique partners, sort and catalog us by experience, type of writing, genre, writing goals, what you like to read … maybe even IQ??? Not that the chances of finding “true love” would be any easier than if you were searching for a life partner, but you’d at least have a solid place to start. Having been through many critiquing first dates and many break-ups (all of which should have come much sooner than they did) during my writing career, I thought I’d pass along what I’ve learned. It isn’t easy to hear criticism, no matter how gently stated or constructive, of your work, your creative baby. But if you’re to grow as a writer, you must learn not to let it cripple your creativity—or light your fuse. You have to devise a way to step beyond the emotion and appreciate the opportunity to view your work through another set of eyes, skills and values. 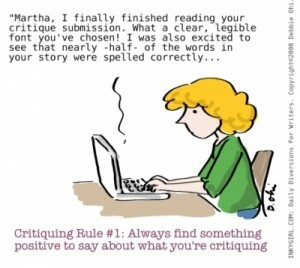 If you can’t, critiquing with another writer is definitely not for you. If you want nothing but praise, ask your mother for feedback. A good rule: never show your work unless you’re ready to hear what is wrong with it. Perfection is an ideal; you’re not going to find it in your own writing, nor will you find it in a critique partner or a spouse. The only way to achieve a happily-ever-after is to strive toward that goal and learn to live within human limitations. Here’s another perk that comes from critiquing another writer’s work. Every time I critique someone else’s work or judge a contest, I learn something new about my own writing. There’s nothing like reading with a critical eye to enhance your perspective of your own work. Just as you shouldn’t change who you are to accommodate that first dater, feedback needs to be considered before you act. Simply because someone is a writer that doesn’t mean their opinion is right, nor should it override your own—no matter how strongly they state it. I’ve discovered there tends to be two distinct reactions to this feedback: 1) A knee jerk reaction to accommodate every criticism; the blind race to make changes; or 2) The immediate fevered and defensive response explaining why your way is the only way. May I state, neither of these serves the writer, or the work. Feedback needs to simmer. It’s best to get over your initial response (whatever it is), step back and carefully analyze the comment, before making any change beyond a spelling correction. As for offering your own wise opinion of your partner’s work, remember, creative writing isn’t math. There isn’t an absolute right answer. It’s important to understand the basic rules of grammar, etc., but even those are occasionally broken to achieve a goal. (Of course, you have to know the rules before you can develop the kind of judgment needed to make that call.) 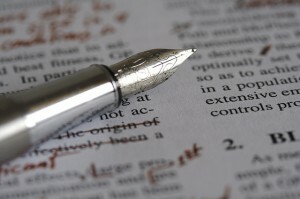 Your job as a critique partner is to offer an observation, a suggestion, open a discussion; not rewrite another’s work. I have been with my critique partners a long, long while. We’ve dispensed with the “compliment sandwich,” and yet the same regard for their creative process needs to be observed. We all have very different writing styles and voices, that’s what makes us successful. If you react to all feedback, you can easily write any personality out of your prose. Critique comments should be a springboard to open a dialog; quite often the real problem isn’t revealed in the original comment, but only comes into clarity through discussion. Each day this week (through Thursday), I’ll discuss part of the process of finding a critique partner. Check back tomorrow for Part Two: The Search!